Last Tuesday, September 7, marked the first day that trans people can apply to be legally recognised in their true gender. The Department of Social Protection published the application form and have begun accepting applications. Ireland is now a global leader in trans rights and is one of just five countries in the world that has legislation based on self-determination. This means that there is no requirement for medical experts, medical treatments or diagnosis of a mental disorder in order for individuals who are 18 years of age or older to be legally recognised. “There is still more work to be done to ensure that young, intersex and non-binary people will also be afforded rights. TENI commits to vigorously advocating for those who need to be included in this Act. However, today we have taken a massive leap forward. This is a turning point for trans rights in Ireland and I hope this leads to further positive changes for our community,” concluded Giambrone. “Today marks the start of the rest of my life, I am having my deepest childhood dream realised. No legislative change could ever happen in the future that could effect me more than the one that was passed. Today my identity has been finally recognised as authentic by the state,” said Sam Blanckensee, 21, trans guy. “I am so proud of my country today! This legislation is something that will make an enormous difference to my life. Finally I will be able to have matching identity documents and I will be spared the discomfort and embarrassment of having to out myself as trans in public settings. So many times in my life I have felt like I had to ask for permission to exist but that will no longer be the case,” said Ben Power, 34, trans man. 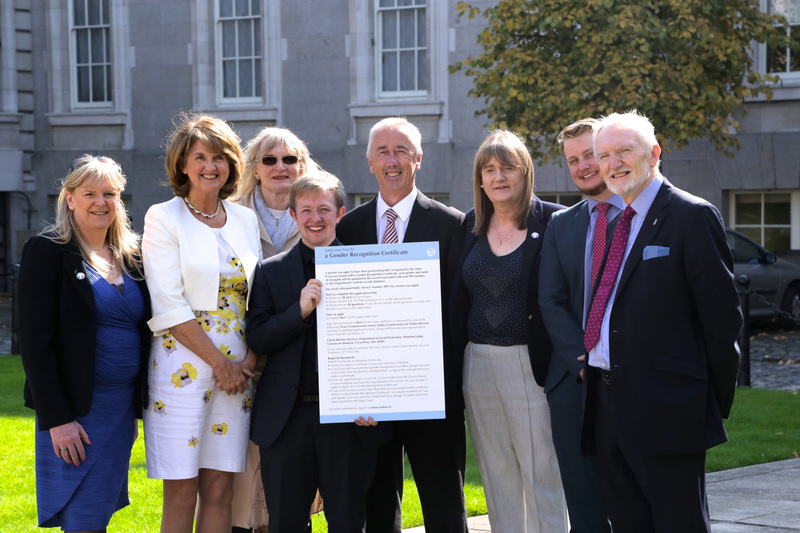 “The Gender Recognition Act is an incredibly important moment for Ireland’s transgender community. Despite some issues this Act including self-determination will change many lives and means a lot. It’s been fantastic to help work towards this and I can’t wait to continue the fight towards recognition for those under 18 and non-binary people,” said Toryn Glavin, 21, trans.